The first 3 miles were PURE TORTURE. The course is so hilly. Like, straight up and down like a rollercoaster. Like, there are no straight parts, just up and down steep hills. The course was the same as last year, but I so don't remember it being that bad. Last year at this time, we lived in a different neighborhood that was almost as hilly, which I thought helped me in the race, being used to it. (Well, as used to hills as you can get. They are tough) The second 3 miles were much flatter. But I felt like it took me 4 miles to get in my "groove", when normally it only takes me 2. I would much rather have those hills at the end when I am warmed up instead of smacking me in the face right at the beginning! In spite of all the hills, I pretty much kept on pace with where I wanted to be. My ultimate goal was to break 60 minutes, which I now know is impossible for me on that course. My main goal is always to beat my previous time. Last year, it was 1:03:10. I starting thinking about halfway that it was pretty sure not gonna happen. (Also, I was thinking, This course was NOT this bad last year and How the hell am I going to do a half marathon. What was I thinking??) I was cooked after 3 miles of those hills. Then, when it straightened out, I started thinking maybe it was a possibility. But dang yall, I was tired. I tried to book it as much as I could, and when I got about .7 miles from the finish I speeded it up. I stone-cold-sprinted that last half-mile. I was so focused I didn't even see my family. I was totally checking my watch. I was at like 1:00. When I crossed the finish, I could barely breathe. Or move. I checked my watch. It said (or so I thought) 1:03:07. I beat it by 3 seconds. Sweet. I did a Tiger Woods-style fist pump and heaved my foot on to the stool to get my chip cut off. After I found the fam I spend about 30 minutes feeling great about the fact that I beat my time by 3 seconds. Once I could see straight again, I noticed my watch said 1:03:17. NOT 1:03:07. Over last year's time by 7 seconds. But surprisingly, I'm not beating myself up about it as much as I thought I would. I still did it and finished. I guess it says something about how much further along I am over last year because I ran at the same pace not training with hills. So, I didn't accomplish either one of my goals. But I'm okay with that. One reason? 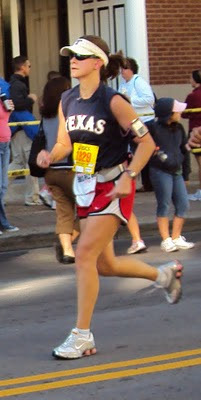 I finally have a pic of me running that I don't HATE. All the ones anyone has ever taken of me is always at the end and I feel like I look ridiculous. Even when I started trying to smile and wave. I look weird. But this time, Husband got a good one. Superficial? Yes. Am I okay with that? YES.